ABSOLUTELY THE BEST BOAT YOU’LL EVER OWN! BIG, FUN, FAST, AND GREAT LOOKING! THE LARGE OPEN DECK AREA IS GREAT FOR ENTERTAINING FRIENDS AND FAMILY OUT ON THE WATER. LARGE SOLID SURFACE COUNTER WITH BUILT IN SINK, MAKES FOR THE PERFECT BAR AREA, OR FOOD STATION. TWO BUILT IN COOLERS ALLOW FOR PLENTY OF ON BOARD ICE, DRINK, AND FOOD STORAGE. MULTIPLE STAINLESS STEEL DRINK HOLDERS, AS WELL AS A SELF STORING ARMREST WITH DRINK HOLDERS ARE JUST ONE ATTENTION TO DETAIL EVIDENT ON THIS MODEL. EVERYONE LOVES THE ON BOARD HEAD (TOILET), AND BATHROOM VANITY WITH SINK. SELF STORING TABLE FOR FOOD AND DRINKS. AMAZING STEREO SYSTEM UPGRADE WITH ADDITIONAL AMP AND 12″ SUB. HUGE SKI AND WAKE BOARD STORAGE AREAS! BRAND NEW BIMINI AND BOW COVER ALL MADE FROM TOP OF THE LINE SUNBRELLA FABRIC. FULL BOAT COVER ALSO INCLUDED FOR COCKPIT AND PASSENGER AREAS. THIS BOAT IS YACHT CERTIFIED. PLENTY OF EXTRA STORAGE UNDER MOST SEATS AND IN THE AREA IN FRONT OF THE HELM. THE MERCURY 350 MAG MOTOR WITH BRAVO 3 OUTDRIVE PROVIDES PLENTY OF GO FAST POWER PUSHING THIS 26’6″ BEAUTY TO 50+ MPH! LARGE SWIM PLATFORM, CONVERTIBLE LOUNGER AND TWO SELF STORING SWIM LADDERS. FULL SNAP IN CARPET, BRAND NEW, NEVER USED! SALE INCLUDES A CUSTOM RED MATCHING PHOENIX TRAILER, WITH DIAMOND PLATE WHEEL STEPS, CUSTOM WHEELS, LED LIGHTING AND SELF STORING RATCHET TIE DOWNS. POWER TO PULL THE BIGGEST WATER TOYS, AND LUXURY TO IMPRESS EVERYONE. 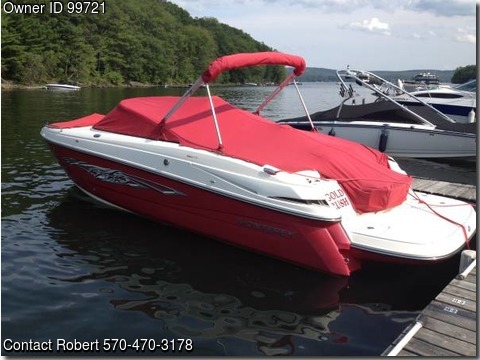 BOAT HAS BEEN METICULOUSLY MAINTAINED, WINTERIZED AND STORED INDOORS EVERY SEASON. BRAND NEW GEL BATTERIES, NEW WATER PUMP THIS YEAR AND STARTER REPLACED LAST YEAR. BOAT WAS OVER $60K NEW AND CURRENT NADA BOAT PRICING HAS IT AT $44,640 AVERAGE RETAIL. THIS BOAT IS PERFECT, AND HAS THE EXTRA MONTEREY HULL GRAPHICS AS WELL! MUST SEE AND TAKE A RIDE! SALE WILL INCLUDE NEW LIFE JACKETS(8), ANCHOR, AND FENDERS (BUMPERS).